Vox: BBC podcast "What is a Milkshake Duck?" rendered incomprehensible. C# Minor. Good to hear you again, Jim. My music is all tested on animals... that is, I make them listen while I'm making it. No ducks, though. Welcome back! It's nice to hear your bizarre vocal manipulations are as potent as ever! Have you tried the milkshake, duck? It's delicious, Jim! I keep choking on the feathers. 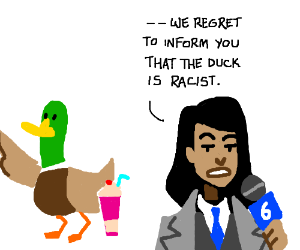 [quote=cfurrow]Have you tried the milkshake, duck? It's delicious, Jim! [/quote] I keep choking on the feathers. Welcome back, Jim! Beautiful spacious melody, delightfully confusing speech mangling, which nonetheless has a classic dimensional-blender groove--really glad to hear it! Wonderful work! Lovely manipulations/edits returning for 2018. Making incomprehensible comprehensible. Nice vocalslicings embedded in this ultragrooving track. Milkshake Duck has moviethemequality. It is great to have you back for another one, Jim! AS always, classy warbling. Thumbs up for the experimentalists. That mallet-ish lead is killer. thanks for the new vocab word jim! [img]http://i0.kym-cdn.com/photos/images/original/001/296/311/d6d.png[/img] thanks for the new vocab word jim! That's a fun Duck for sure! Liked the part toward the end when vocal and melodic sound are more in unison. Nice work, welcome back. Sounds exciting and unusual in a good way. Fav. Milkshake duck loool. Funny. :) Sounds exciting and unusual in a good way. Fav. Thanks, guys! Only cats used for testing purposes (they totally ignore it). [quote=E-dub]Good to hear you again, Jim. My music is all tested on animals... that is, I make them listen while I'm making it. No ducks, though. [/quote] [quote=CosmicCairns]Welcome back! It's nice to hear your bizarre vocal manipulations are as potent as ever! [/quote] Thanks, guys! Only cats used for testing purposes (they totally ignore it). [quote=onezero]Welcome back, Jim! Beautiful spacious melody, delightfully confusing speech mangling, which nonetheless has a classic dimensional-blender groove--really glad to hear it! Wonderful work! [/quote] [quote=rdomain]Lovely manipulations/edits returning for 2018. Making incomprehensible comprehensible. <3[/quote] [quote=r2me2]Welcome back. Nice track [/quote] [quote=Q-Rosh]Nice vocalslicings embedded in this ultragrooving track. Milkshake Duck has moviethemequality. [/quote] [quote=chra]nice :) [/quote] [quote=laguna]It is great to have you back for another one, Jim! AS always, classy warbling. Thumbs up for the experimentalists. That mallet-ish lead is killer. [img]https://media.giphy.com/media/C4dbohiRXTBFC/giphy.gif[/img][/quote] Thank you all for your kind comments! the vocal cuts are weird as heck and i love it. cheers! Yeah, I usually ltry to tidy things up towards the end of a piece. Prefuse 73 is one of my favorites. Great stuff - those mallets are fab. Strange how I get lulled into the choppy momentum. Makes me long for the return of Severed Heads.